Oregon's Department of Fish and Wildlife killed its first salmon-eating California sea lion of 2013 Tuesday after trapping it near Bonneville Dam. The department, working with the state of Washington and the National Oceanic and Atmospheric Administration, started killing California sea lions by lethal injection in 2009. The states are authorized to kill up to 92 California sea lions a year, provided they've been seen eating salmon near Bonneville Dam, have visited the dam at least five times over multiple years and have not responded to non-lethal hazing. Last year, the states killed 12 sea lions and sent another to the Shedd Aquarium in Chicago after capturing the animals in traps by the dam, the first on the Columbia River. The sea lion killed by lethal injection Tuesday, branded C022, was placed on NOAA's eligible to kill list in May 2012. He could have been transferred to the Queens Zoo in New York, which has offered to take two sea lions. But ODFW veterinarians found signs of precancerous lesions that made him ineligible for transfer, the agency said. 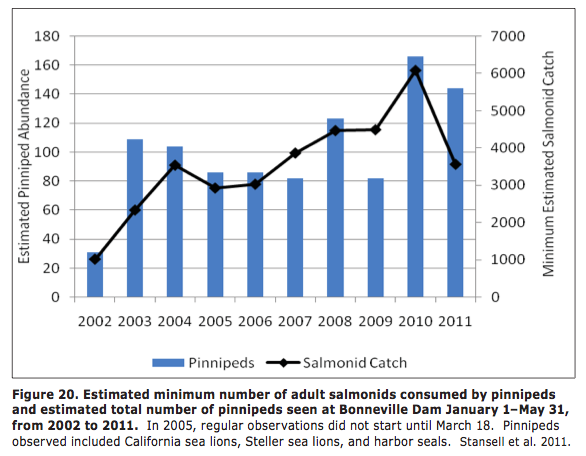 Oregon Kills First Salmon-eating Sea Lion of 2013 at Bonneville Dam <-- Full story available at original site.